YES provides young job seekers, entrepreneurs and artists with English-language services to help launch their careers. 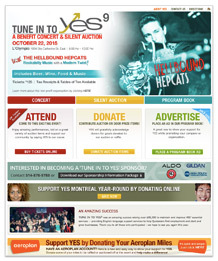 The non-profit needs a transactional microsite for their large annual fundraiser, Tune In To YES, to manage program book ad placements, auction item donations and ticket purchases online. HTC had previously created YES Montreal’s complete Corporate Identity and built on the existing logo design to incorporate images of headlining act, Lorraine Klaasen, for the marketing campaign. The campaign colour scheme embraces the fun, festive African elements of her look from her recent album, Africa Calling. HTC produced all campaign print collateral including designs for the ticket, postcard, hard-copy PDF forms, poster and promotional card. Additionally, HTC generated the outreach email template and full press release and organized a promotional giveaway of Klaasen’s album to effectively promote the event. 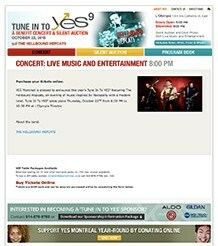 The simple, 8-page Tune In To YES microsite needs to draw all the campaign elements together and showcase the three easy ways supporters can give to the cause: by purchasing tickets for the event, donating items to their silent auction, or advertising in their program book. Online ticket and ad purchases are integrated with their service provider to automate credit card transactions, minimizing time-consuming processing tasks. In addition to purchasing tickets, donating or advertising through the website, front-end users can listen to the first single from Africa Calling, get directions to the event location, find out more about YES or the event schedule, and read testimonials. Submission Manager was created to process ticket purchases, auction item donations, and program ads placed through the front-end website. Administrators can accept or reject pending items in the three listings and follow-up or track items when required. The online system reduced administration costs and streamlined the ticket purchasing process with automated transactions. Most importantly, the campaign helped YES double the funds raised from the previous year’s event and strengthened their position as a valuable service to the Montreal community.